"Productive Week Here Wasted Saturday, Not All In The Northern Forest!" It was great week here! With all the wet weather & extreme cold temperatures, we were able to finally put in a nice 6 mile trail on the lake. We had a great couple of runs on the new trail that is better than any race trail I have been at. Of coarse, I prefer to stay in the Forrest. 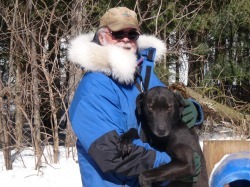 The dogs had a great time & so did the Musher. Saturday, We packed up the the dogs & headed to the Race at L'Epiphanie. After a 2 hour plus drive, we arrived at the race site after driving through blowing, driving snow with difficult road conditions. At the race site was high winds creating white out conditions causing trail problems with the 6 dog class were some teams were running in circles searching for the trail & others getting lost on a road by the trail. The icy conditions under the trail created a hazardous condition resulting the cancellation of the 8 dog & unlimited team races. This was the correct call by the race organizers for the safety of the dogs & mushers. The decision whether to continue the race on Sunday would be made Sunday morning. We ended up driving back to the chalet on Saturday night again through a snow storm. The weather forecast was high winds with gusts up to 51 km/hr on the Sunday & if correct there was a good possibility for some of the same whiteout conditions on the Sunday. With this information, we decided to cancel out on the race & work on our trails here for this coming week of training to prepare for next weekends race.